following a string of armed robberies, one of which left a man with gunshots to his hand. In all three reported incidents, the robbers approached their victims, displayed a handgun and demanded property. Two of the incidents happened on the same block. Anthony Kuber was one of those victims. Thursday was his third day at John H. Stroger Jr., Hospital of Cook County after he was attacked as he walked west through a viaduct after getting off the Chicago Transit Authority's Red Line at 47th Street. "He had his headphones on, listening to his music with his iPhone out," said Kuber's fiancée, Elizabeth McArthur. "They said, like, 'Give me everything you got," and all he said was, 'Here, take it.' They took everything. That wasn't good enough. They wanted him dead." Kuber took bullets to the hand. 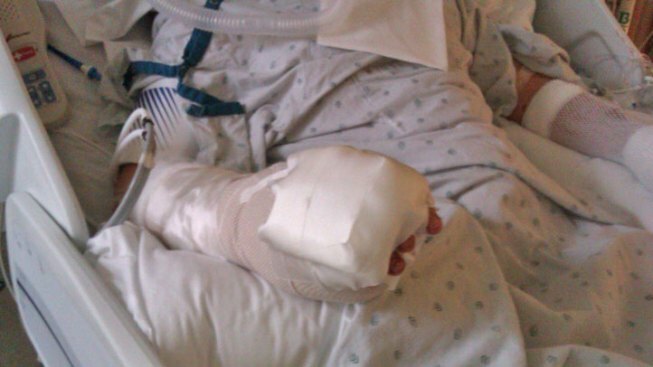 His injuries are so severe that he may never be able to use his hand again. McArthur said the iPhone wasn't even worth much because her fiancé had recently dropped it, shattering the glass. "It's the most disgusting, despicable thing that could possibly happen," she said. "They shot to kill him. They didn't shoot to hurt him." Kuber, who at the time was not aware of the other robberies, said Wednesday that he thinks there should be a greater police presence near the viaduct where the attack took place, calling it dark and dangerous. "This is an area where there should be a squad car there anyway," Kuber said. "I'd hate to see someone else walking under there and get hurt." Police said the robbers were two or three black males between the ages of 18 and 28. They stand between 5 feet, 8 inches and 6 feet, 2 inches tall, have an average weight and were wearing wearing dark clothes, hoods and masks. Anyone with information on the attacks should contact Chicago police.